Marula oil works splendidly as a carrier for aromatherapy, deeply massaging active ingredients. Marula oil we know and love as a first class moisturiser and anti-aging remedy – it is pleasing to see that people are finding other uses for it; here as a carrier oil by the Mystic Moments company packaged for aromatherapy purposes. Carrier oils play an important role in aromatherapy treatments, diluting potent aromatics so that they can be absorbed by the body without irritation. Usually they are neutral or nutty in aroma, and generally they derive from the seeds or kernels of plants. Evening primrose oil, olive oil and avocado oil are amongst the most famous carrier oils. Most cosmetics you buy is based on the carrier principle – in a tube of hand cream for example will be your active ingredient in trace quantity mixed in with an oil or emulsion that “carries” the ingredient and aids the body’s interaction with it. What makes marula oil such a good carrier oil? This is largely due to its characteristics of high absorbence by the skin. Being made primarily of omega oils, the small molecular construction seeps through the skin very easily and is a very dry oil that leaves no greasy residue. A second interesting layer of defence is the presence of palmitic oil which is part of marula oil’s composition – it creates a guard between the oil and the outside world, sealing the marula oil into the skin layers. Of course, marula oil is more famous for its recent media attention as a miracle oil for moisturising and anti-aging. Originating from the southern parts of the African continent, marula oil has been an essential commodity with purposes ranging from skincare and haircare usage through to cooking and preserving meat, to even making alcohol. Elephants are a big fan of the fruit of the marula tree, but you probably don’t want to be around them too long when they’ve been at a fermented batch! The bark of the tree is claimed to have medicinal properties as well. No wonder that the trees are venerated with great respect and may be a point for meetings, rites and celebrations. In the past few years, word of marula oil has escalated throughout the beauty and skincare world all over. Why is this? Mostly it is due to the trend for natural oils that are winning favour with consumers who feel that working with nature is of greater holistic benefit to them than synthetic products of unknown provenance. We have seen coconut oil take the market by storm, appearing in the food aisles and in every cosmetic under the sun, similarly argan oil arrived with its high antioxidant concentration. Marula oil, however, goes one further than even argan oil with the antioxidants and also provides all manner of vitamins and minerals to keep your skin, hair and body in tip top healthy condition. If you are keen on aromatherapy or massage, give marula oil a go – you may be surprised at all the extra benefits marula oil can provide on this front. 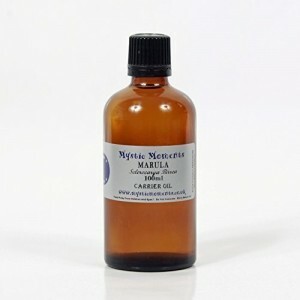 Mystic Moments marula carrier is available right here on this link at, I have to say, remarkably good value for 100ml.